Unmanned Aerial Vehicles (UAVs), also known as drones, have transitioned from military usage to many beneficial societal applications such as science research platforms, mapping the terrain, creating three-dimensional models of the land surface or of objects, search & rescue, aerial reconnaissance during wildfires, capturing glamor shots of properties, and many other scientific, commercial, educational, and hobbyist applications. The Federal Aviation Administration (FAA) estimated that more than 1.9 million small, hobbyist drones were sold in 2016 and forecast that as many as 4.3 million will be sold by 2020. The growth of jobs related to drones is expected to increase significantly over the next three years. Leveraging the popularity of recreational drones, UNAVCO Education and Community Engagement (ECE) staff collaborated with staff from multiple organizations and agencies as part of the Federation of Earth Science Information Partners (ESIP) Education Committee to inspire learners to use drones as a platform to collect and analyze local-scale data using lightweight cameras and/or sensors. 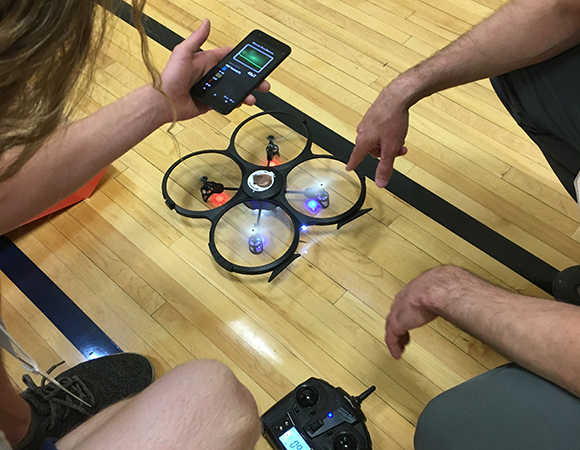 Points of connection between the Drones in STEM project and geodesy include laying the foundation for students to learn about reference frames, image collection, perspective, and distortion, and basic 3D modeling from overlapping photographs. 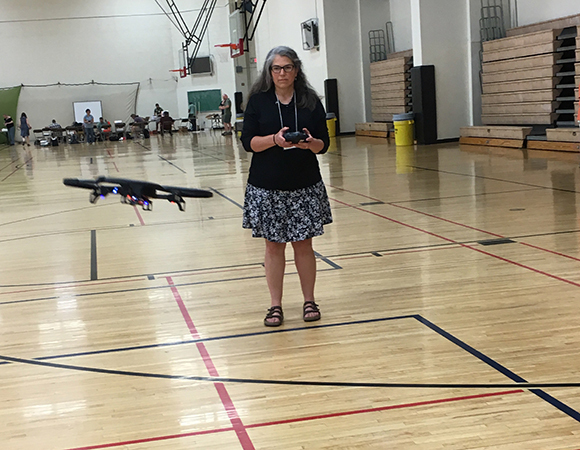 Flying drones serves as a great entry point to stimulate curiosity and encourage students to engage in science, technology, engineering, and math (STEM) investigations. 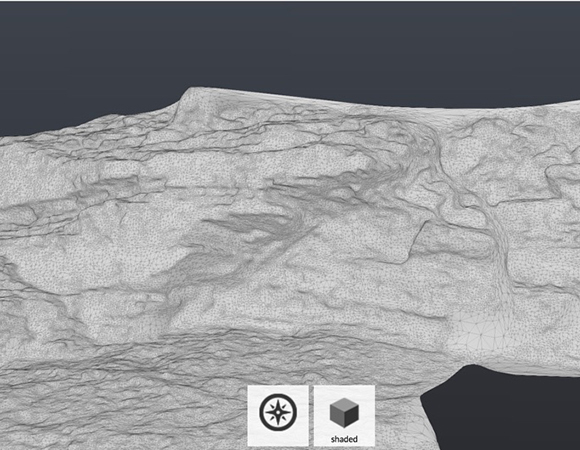 Prior to this project, there were no drone-focused geoscience-education resources available online. Over the past two years, this team partnered with educators, researchers, and data scientists to develop mini-learning activities and pilot materials at several education workshops. 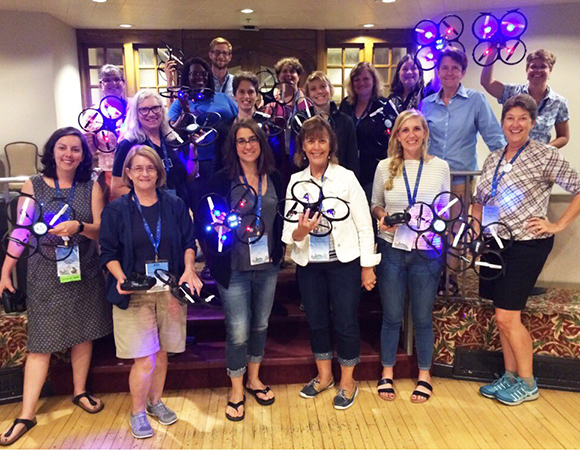 UNAVCO ECE staff and other partners taught about the drone-specific resources at eleven hands-on workshops at ESIP meetings, National Science Teacher Association regional conferences, and the Earth Educators' Rendezvous (EER). In all, the workshops reached 267 college faculty, K-12 educators, educational professionals, and researchers. 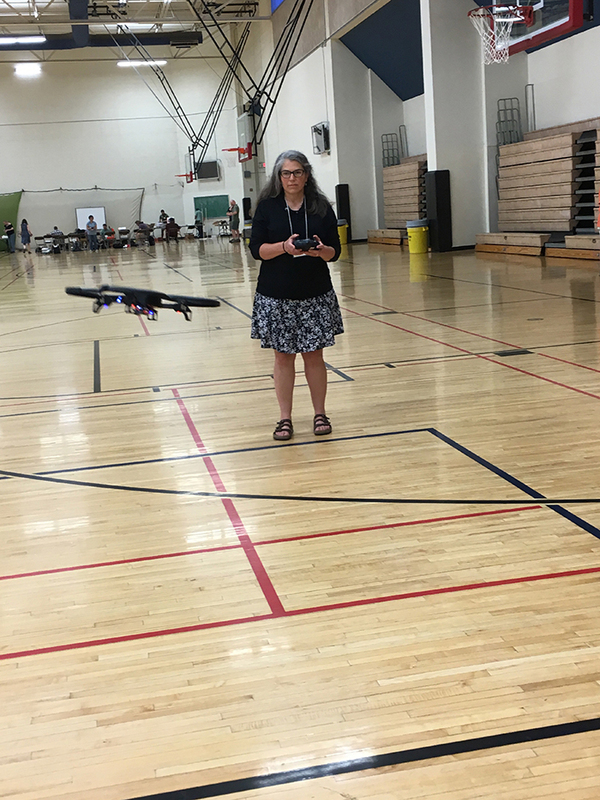 Workshop participants practiced UAV flying skills, learned about drone regulations, civility, and safety, experimented with lightweight sensors, learned about current drone-enhanced research projects, tested existing activities, and designed student-focused investigations for their teaching environments. This partnership with ESIP also provided UNAVCO ECE the opportunity to more broadly disseminate GAGE educational materials, to co-develop education products, and to evaluate UNAVCO materials, to build more connections to agencies and organizations not typically reached. 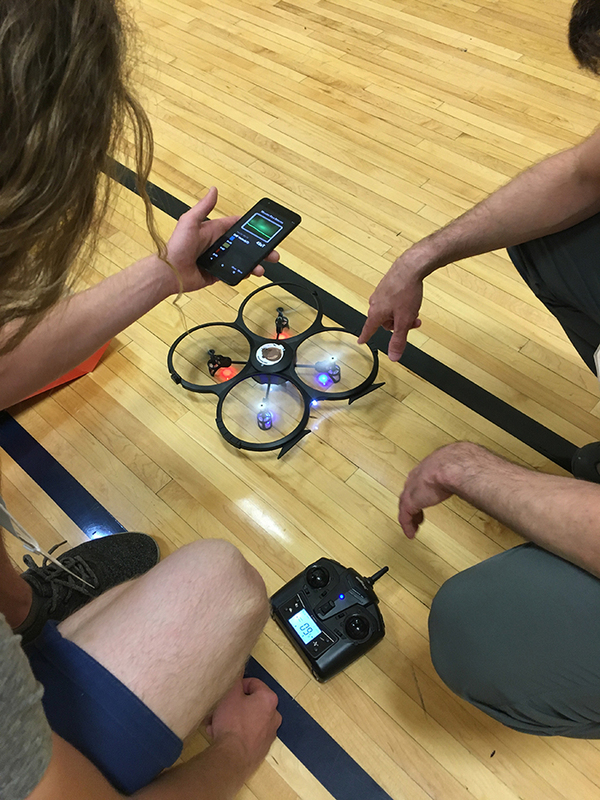 During this project, the team produced seven drone-specific hands-on activities and numerous proto-activity outlines, handouts such as a drone pre-flight checklists, and presentation content. 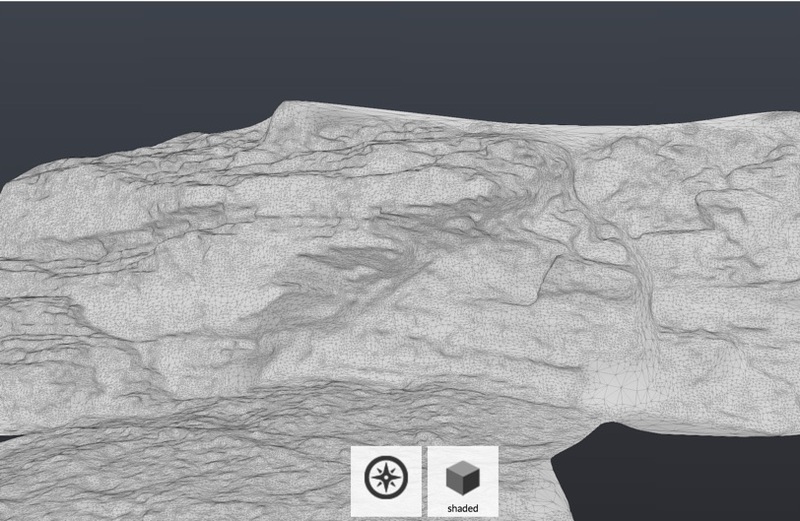 The UNAVCO-developed activity 3D view from a drone: Make a 3D model from your photos is available on UNAVCO’s website, while the full suite of drone-specific hands-on activities are available on the UCAR Science Education Center website. 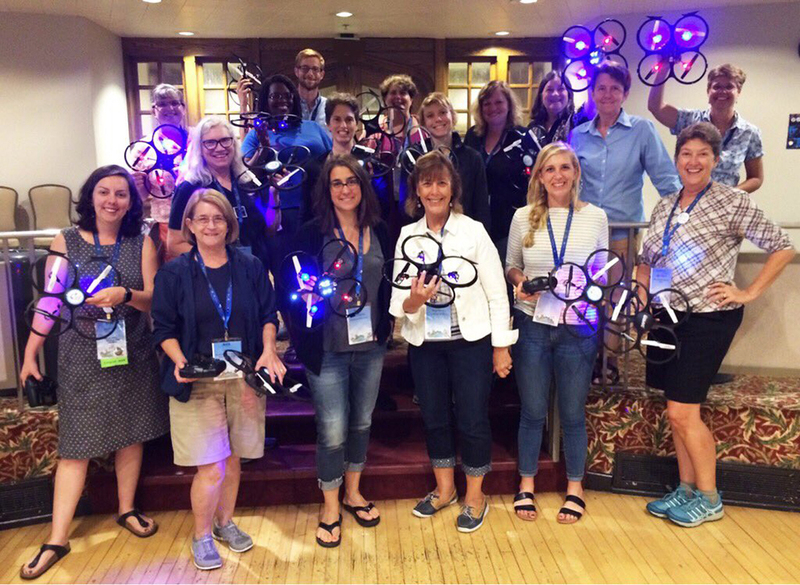 Workshop course materials such as handouts, checklists, presentation content, and links to FAA regulations and other drone related resources are available through the UNAVCO Drones in STEM (science, technology, engineering, and math) courses 2017 workshop materials page.